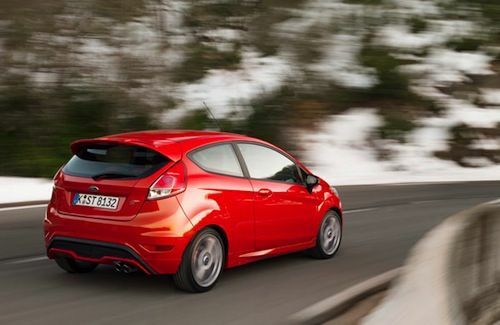 Ford has released information on the 2014 Ford Fiesta ST and it gets even faster with more power. It also gets an increase in fuel efficiency making it the most powerful fuel-efficient small production performance car on the planet. Ford Europe tells us that the new 2014 Fiesta ST now comes with 20 percent more power and fuel economy than the previous model. The performance Fiesta was already a fast compact car before, but it gets even quicker. Ford has tuned the small cars powertrain, suspension, steering and brakes to give global driving enthusiasts even more to smile about. It shows up in the performance numbers and translates to an exciting ride on the road or track. The performance Fiesta ST sprints from 0-62 mph in 6.9 seconds, and has a top speed of 137 mph. Ford’s new EcoBoost engine technology is producing fantastic results in both power and fuel efficiency. The1.6-liter turbocharged EcoBoost 4-cylinder produces 197 horsepower and 214 lb-ft of torque, and at the same time delivers 47.9 mpg (European combined) and 138 g/km CO2. The powerplant enables 20 per cent fewer CO2 emissions but 20 per cent more power compared to previous generation Fiesta ST. The first 2014 Fiesta ST rolled off the production line last month in Germany. Ford takes their performance cars seriously and the small compact performance car delivers absolute precision in power and handling. The EcoBoost engine’s low weight contributes towards improved handling, and features the latest technologies that include turbocharging, high-pressure direct fuel-injection and Twin-independent Variable Cam Timing. The powerful EcoBoost engine is coupled to a new six-speed manual transmission calibration that was refined at the Nürburgring Nordschleife over the equivalent of more than 100 laps of the 21km circuit. Ford further subjected the hot hatchback to 7,500 km of race track testing and 5,000 km of high speed testing before it reached production. The new 2014 Fiesta ST was developed by Ford Team RS, which is the European arm of Ford Motor Company’s Global Performance Vehicle group. Ford Team RS tuned the powertrain, suspension, steering and brakes for maximum driving dynamics for performance enthusiasts around the globe. The hot hatch also features performance goodies previously found in larger performance cars, That includes enhanced Torque Vectoring Control (eTVC) and 3-mode Electronic Stability Control (ESC), six-speed manual transmission and rear disc brakes. Ford designed the new 2014 Fiesta ST with durability and the ability to handle conditions on the track. Ford made sure the Fiesta ST’s engine, transmission, chassis and body could hold up to the rigors of extreme use that its performance invites. The performance character is also seen on the inside of the cabin and features carbon fiber dashboard inserts, alloy-metal pedals and gearshift, and a ST steering wheel. The new 2014 Ford Fiesta ST is Ford’s latest model that will put a smile on global performance enthusiasts face corner after corner. So why do the Europeans get to have all the fun?